The ATS635LSE and ATS636LSE programmable, true power-on state (TPOS), devices are optimized Hall-effect IC and rare-earth pellet combinations that Switch in response to magnetic signals created by ferromagnetic targets in gear-tooth sensing and proximity applications. The devices are externally programmable. A wide range of programmability is available on the magnetic operate point (BOP) while the hysteresis remains fixed. This advanced feature allows for optimization of the circuit switchpoint and CAN drastically reduce the effects of mechanical placement tolerances found in production environments . A proprietary dynamic offset cancellation technique, with an internal high-frequency Clock reduces the residual offset voltage, which is normally caused by device overmolding, temperature dependencies, and thermal stress. Having the Hall element and Amplifier in a single chip minimizes many problems normally associated with low-level Analog signals. This device is ideal for use in gathering speed or position information using gear-tooth-based configurations, or for proximity sensing with ferromagnetic targets. The ATS635LSE switches high in the presence of a ferromagnetic target or tooth and switches low in the presence of By Allegro MicroSystems, Inc. This is one package pinout of ATS635LSE,If you need more pinouts please download ATS635LSE's pdf datasheet. 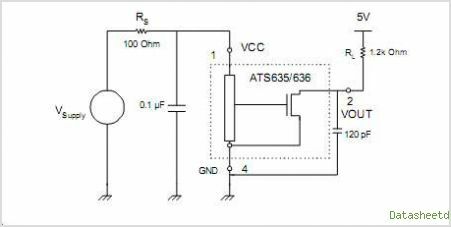 This is one application circuit of ATS635LSE,If you need more circuits,please download ATS635LSE's pdf datasheet.